Windows Vista took what seems like a giant leap backward in Disk Defragmenter software from what was available in Windows XP. I believe both versions are a feature-limited version of Diskeeper, however, the Windows Vista version is so hobbled as to render it practically useless. Even though I run the Vista Disk Defragmenter software weekly, two alternatives (Diskkeeper and DiskMagik)showed my drive remains highly fragmented. This means the Vista Disk Defragmenter isn't doing its job, which ultimately means my computer's performance is suffering. While some of that visual feedback in Windows XP is largely there to give you the impression that something is happening, Vista Disk Defragmenter is so limited that you really can't do anything beyond schedule and scan. And while it's true that XP Disk Defrag did not have a schedule option built in, it was an easy matter to configure Windows Scheudled Tasks to run the XP version automatically. 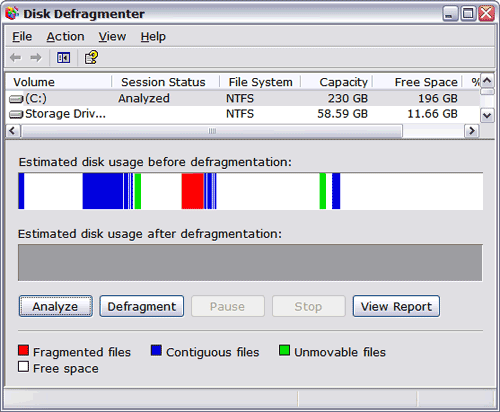 Why is Disk Defragmenting Important? As you ad more files to your computer over time, Windows has to find places on your hard drive to store them. Often this means splitting the files up into pieces and storing them in chunks throughout the hard drive. This is perfectly normal, but it slows things down because at the time you access any of those fragmented files, to watch a movie for instance, Windows then needs to reassemble the fragments. 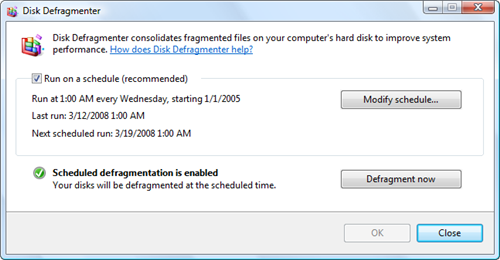 Using a disk defragmenter should re-organize this data on your drive so that files are store contiguously, making it faster for Windows to open the files later. This is especially important for disk-write intensive tasks like video editing. For Disk Defragmentation software to be effective, you need software capable of working in the background while other applications are open. You need the ability to run boot time defrag operations on system components that can't be defragmented while your computer is launched into Windows. It's also useful to be able to control which drives get defragmented, have rules about when your defragmenter doesn't run (like when your laptop is on battery power), and generally allowing you to maintain control over what the software does. Windows Vista Disk Defragmenter fails at all of these. There are a number of disk defragmenting tools available. I've always strongly recommended Diskeeper, because they are the industry pioneer in the defrag space and continue to provide innovative solutions for defragmenting. The software comes in several different varieties, although for most home users either the Diskeeper Home or Diskeeper Professional should suffice. Two big differences between the versions are something Diskeeper calls FragShield, which helps prevent fragmentation of Windows system files, and 64-bit operating system support. A much newer entrant to the disk defrag space is DiskMagik. DiskMagik appears to be feature competitive with Diskeeper Home, offering boot time defrag options, scheduling, and proactive defrag that runs while you have other things going on your system. Either of these solutions would make a great alternative to the lousy experience that ships with Vista. I suggest turning off the onboard defrag and giving the trial version of either Diskeeper or DiskMagik a test drive to see what kind of performance improvements you get as a result.